Nov 5 2012 (IPS) - During an interview at the Hilton Hotel in downtown Nairobi, David Kuria Mbote, Kenya’s first openly homosexual candidate for public office, stresses that his campaign will not be only about gay rights.It is, he said, about tearing down the structural barriers in healthcare, education, and the economy that harm all Kenyans. “We have many people who are trapped in the cycle of poverty,” he told IPS. “My county Kiambu is not the poorest county in Kenya, but those who are poor in Kiambu are really, really poor, and many times they cannot escape that cycle of poverty. What we want to do is create small projects, like rabbit farming for example, to help them break that cycle. Once they can do this they will be more able to work their way to a better life. KENYA: A Brand New Constitution, But Can Women Enjoy Land Rights? In a country where homophobia is the norm and most homosexuals keep their sexual orientation secret, Kuria, a 40-year-old activist, is running as an independent candidate for a senate seat in Kiambu County, north of Nairobi, in the March 2013 elections. He is not only running against two veteran politicians, but against the prevailing view that homosexuality is repulsive. In various polls taken in Kenya over the past five years, more than 90 percent of respondents said homosexuality went against their beliefs. And while the 2010 constitution aims to “preserve the dignity of individuals and communities and to promote social justice and the realisation of the potential of all human beings,” the pre-constitution penal code criminalises homosexual activity with up to 14 years in prison. While very few sentences are carried out, there have been many cases of police officers demanding bribes from homosexuals seeking to avoid arrest, according to Kuria. HIV/AIDS prevention and treatment is one of Kuria’s main issues, arising from his work as co-founder of the Gay and Lesbian Coalition of Kenya, an umbrella organisation. Kuria said that Kenyan doctors turned away homosexual patients, and that gay men were poorly educated in HIV prevention. In one case, he said, a nurse called the entire staff on the floor to come see the gay man. According to the United Nations, as of last December 1.6 million out of around 40 million Kenyans were living with HIV – more than in the United States, Canada, Britain, and France combined. Kuria said that non-communicable diseases such as diabetes and cancer also need new treatment policies. 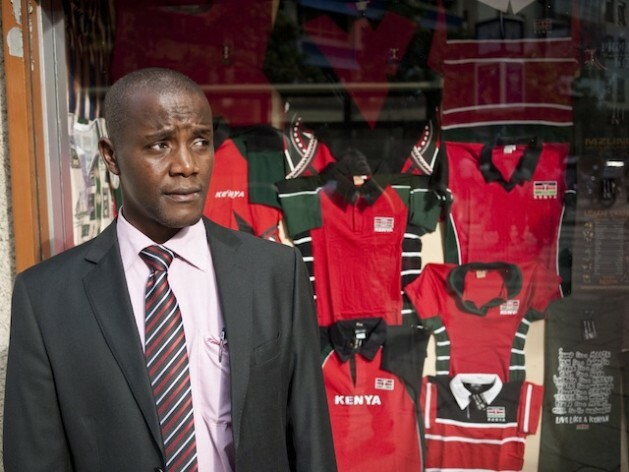 In Kenya, the only openly gay public figures are a few activists, including Kuria. When IPS asked him why he went public in a society so averse to his sexuality, he cited an experience trying to pressure the National AIDS Commission to include gay men as an HIV risk group. “At first the woman in charge told us we were attention-seekers. But after they released the Kenya AIDS survey and modes of transmission, they started seeing the things that we were telling them: that gay men were a high HIV risk group, and that this needed to be addressed. “And this same lady that called us attention-seekers became so pro-active for us it amazed me. It showed me that people could change. Witnessing that shift pushed me to do more,” he said. Kuria’s frankness in public about his sexual orientation shocked many, especially considering that between the ages of 13 and 27, Kuria was preparing to become a Jesuit priest, graduating with degrees in theology and philosophy. Since leaving the seminary, he has earned an MBA at the University of Nairobi and this December he is scheduled to receive a master’s degree in finance. Countering African society’s take on homosexuality, however, will not be easy. Mike Waters in South Africa is the only openly gay member of parliament on the continent. And current Kenyan prime minister and presidential candidate Raila Odinga said during a speech in November 2010 that homosexuals should be arrested, adding that there was no need for gay couples because there were more women than men in Kenya. In mid-October the UK-based gay rights advocacy group Kaleidoscope Trust invited Kuria to speak at a seminar about leadership. He spoke there with Christopher Robert Smith, Britain’s first openly gay MP. “He just told me to stick to the message, and that if the message was credible people would listen,” Kuria said. “David is an inspirational and very brave man who is willing to stand up and be counted on a continent where for generations gay people have been forced to keep their heads down or risk physical attack or worse,” Lance Price, executive director of the Kaleidoscope Trust, told Oxford University’s student newspaper. On Facebook and Twitter, Kuria’s campaign has stirred many hateful comments. And he recently received an email saying “Rest in Peace”, although it came from the United States. But he said he has not experienced many problems with homophobia. At the moment, Kuria does not travel with security, but he said that might change if he starts polling well close to election day. He said, however, that voters will look past their own prejudices come March. “I think people will see me as a political outsider, with no roots in the establishment,” he said.